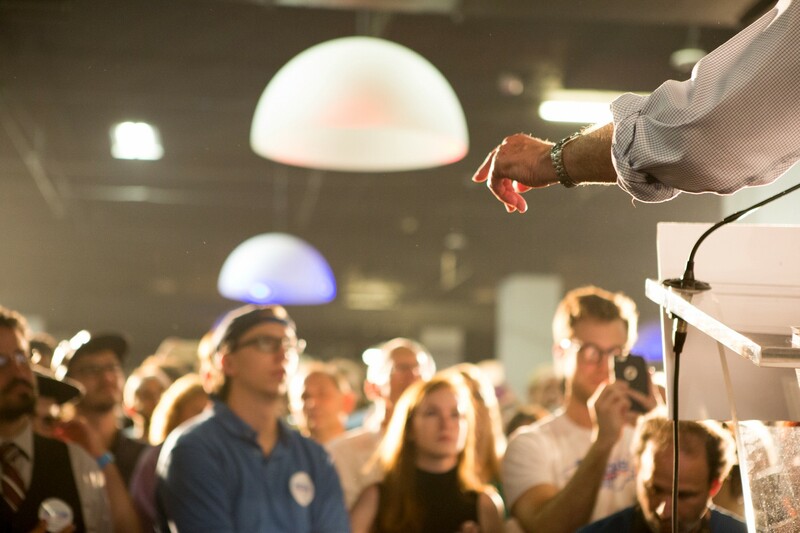 Last week, on December 13th, Senator Bernie Sanders spent the 200th day of his Presidential Campaign meeting folks all over Iowa; speaking with seniors in Mount Carmel, convening a roundtable with veterans in Waterloo, holding at a town hall in Mount Vernon and opening an office in Davenport Iowa. It probably reminds you a lot of this September when the campaign marked its 100th day with another long day of events in Iowa. The reality of it is that these anniversaries are “Hallmark Holidays”, sign posts that mark the passage of time and hold little other significance. 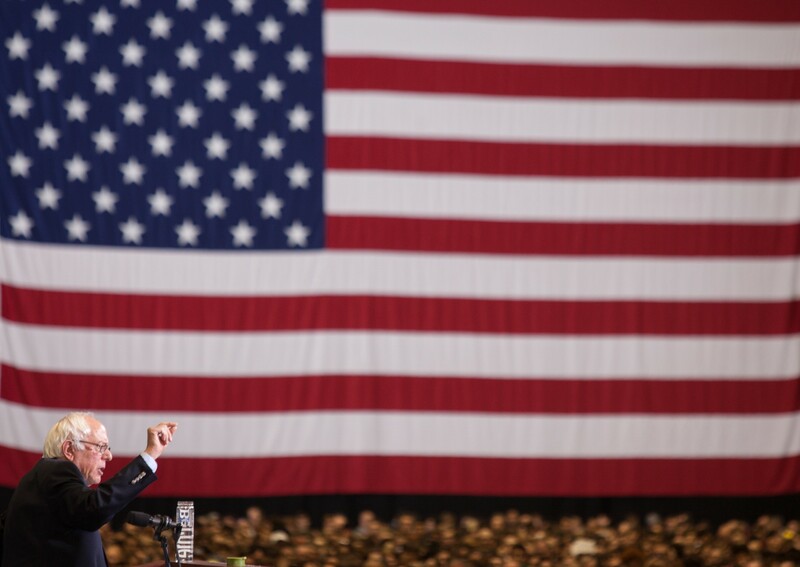 As much as the media tries to define “phases” of a campaign (introduction of the candidate, sharpening of contrasts, the final push), the reality is that any campaign that is able to will always try to hold a wide spectrum of events from stadiums to picnic table meetings and everything in between. 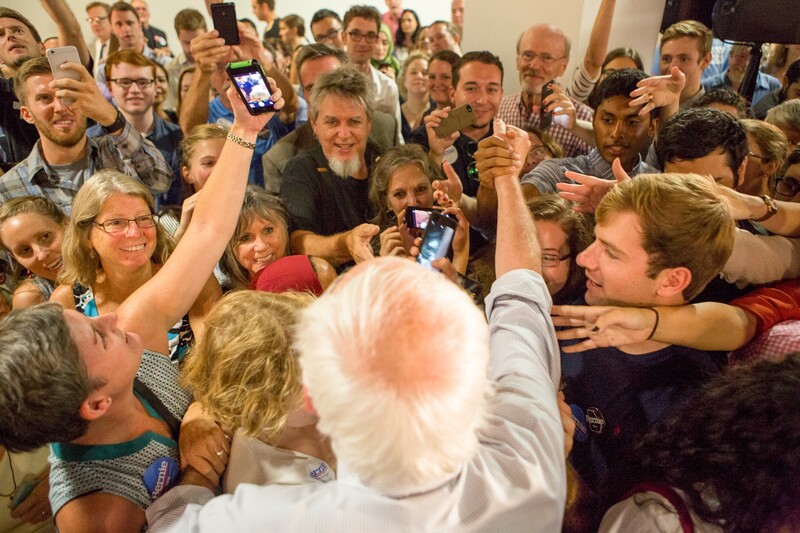 A political revolution has to both meet people where they are physically and engage them with real solutions to problems in their lives. That can happen in large spaces alongside friends and neighbors in the community or in intimate venues where voters can ask questions and get access. Our team’s pictures reflect that variety as surely in these second hundred days as in the first. You will see the additions of two new photographers on the team who helped Fred, Hilary, Eric and myself collect these images. 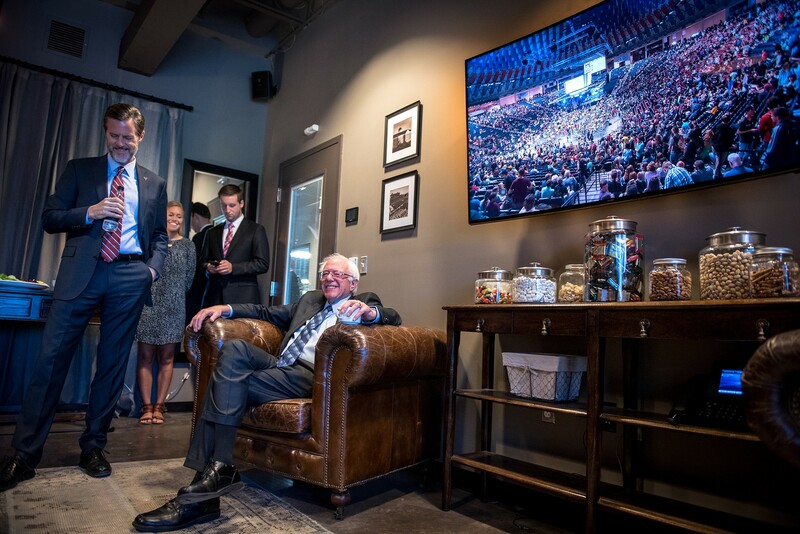 Christopher Dilts, who took the photos at Liberty University and the University of Chicago Institute of Politics, and Ella Driscoll, who is the granddaughter of Senator Sanders and took the portrait of Bernie in a green room in New York City. Thanks so much and see you in 100 days after the first votes have been cast in the 2016 election! 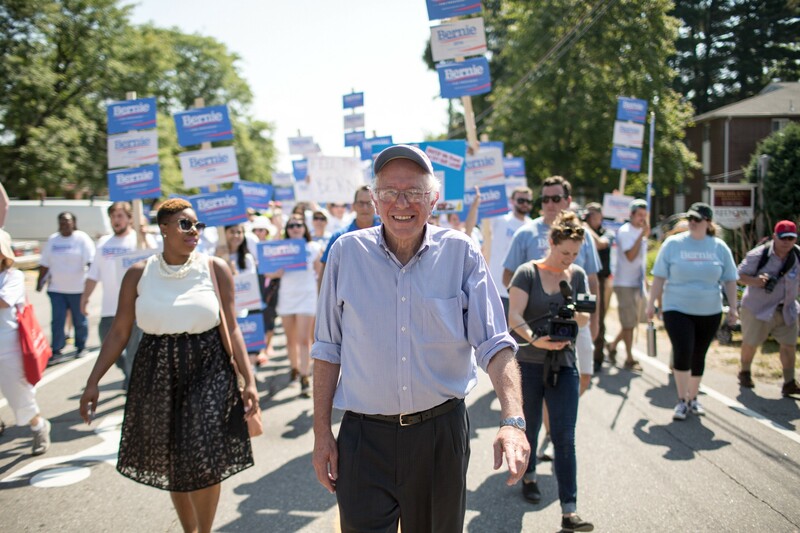 Senator Bernie Sanders and his national press secretary Symone Sanders (no relation) march in the Labor Day parade in Milford, NH. 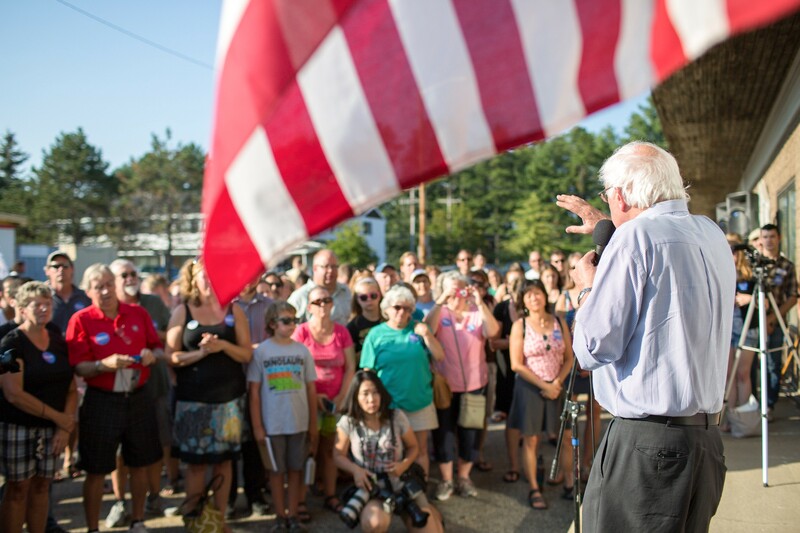 Senator Bernie Sanders addresses a crowd at the opening of a campaign office in Concord, NH. Bernie 2016 has 16 offices in NH currently. Senator Bernie Sanders speaks to supporters at 200 Peachtree in Atlanta, GA. 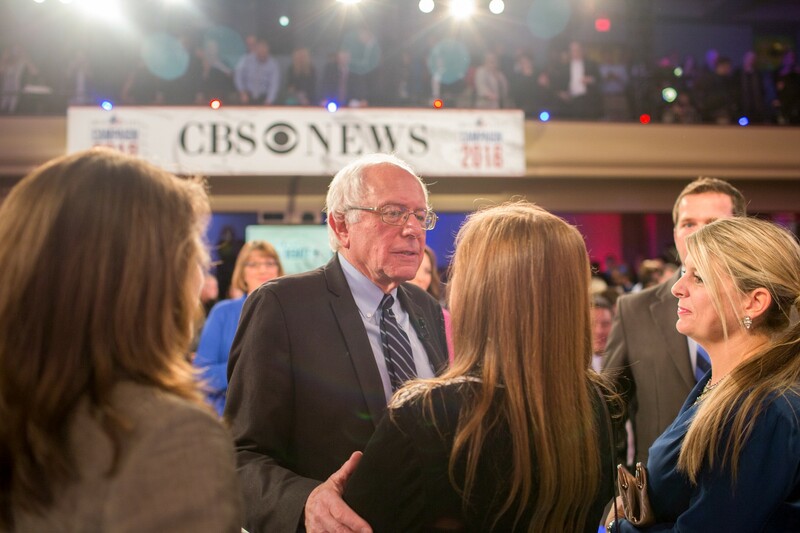 Senator Bernie Sanders greets the crowd following remarks at 200 Peachtree in Atlanta, GA. 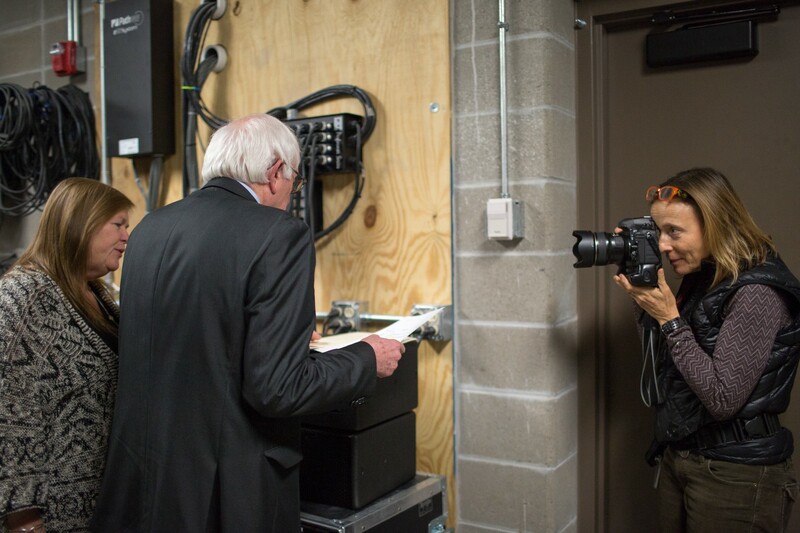 Senator Bernie Sanders waits backstage before a speech at Liberty University in Lynchburg, VA. 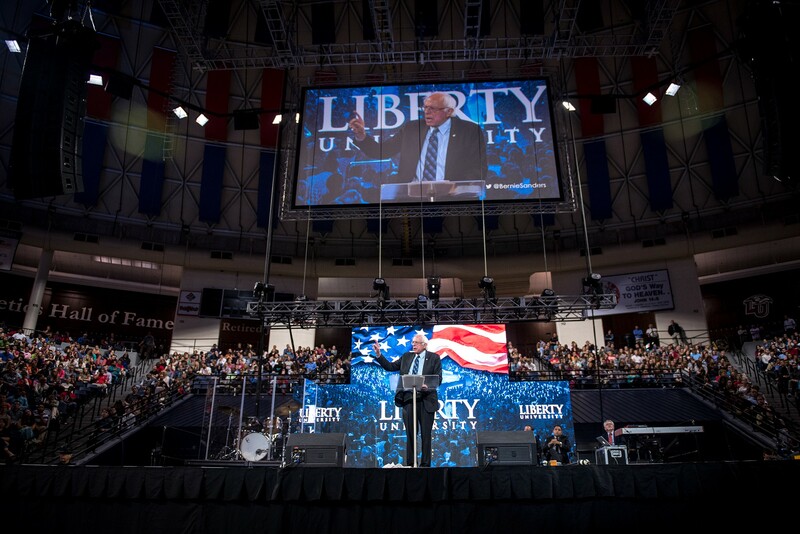 Senator Bernie Sanders addresses students and faculty at conservative institution, Liberty University, in Lynchburg, VA. 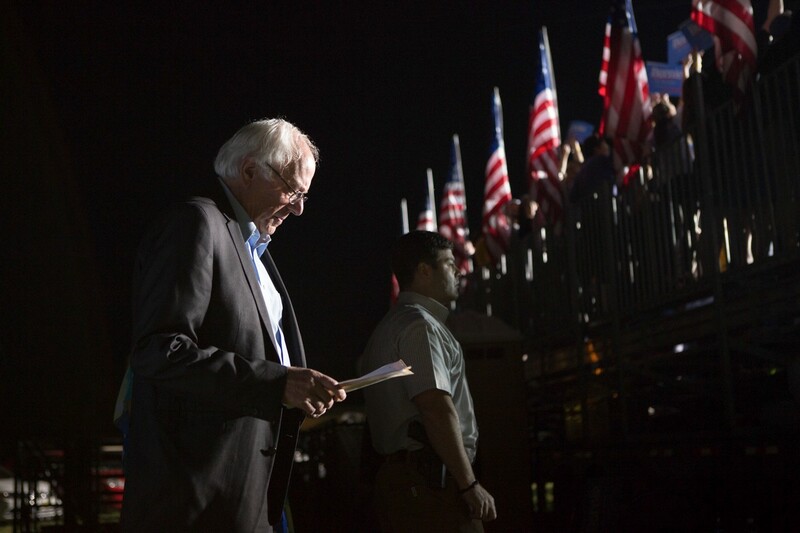 Senator Bernie Sanders stands behind the bleachers at a rally at the University of Virginia in Charlottesville, VA. 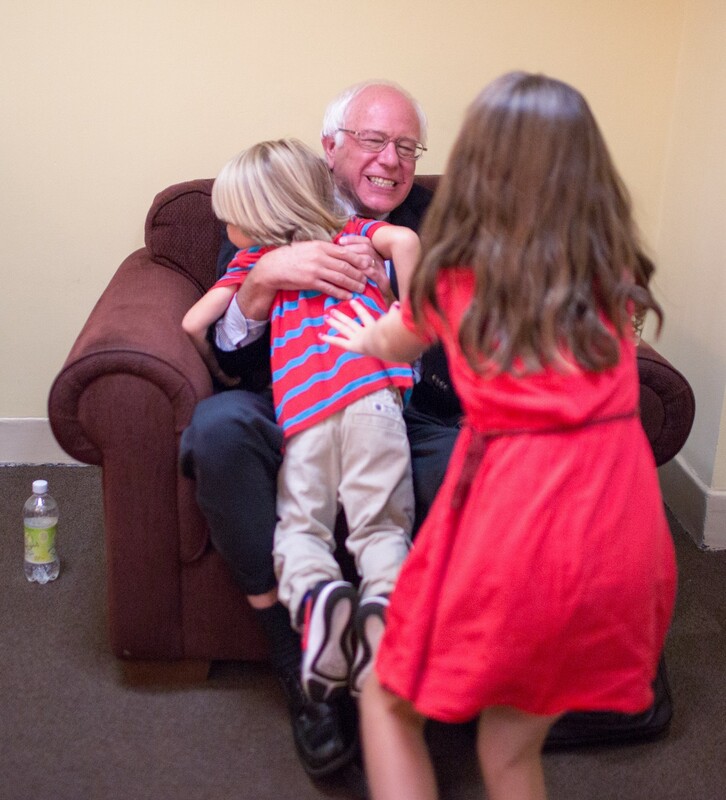 Senator Bernie Sanders greets his grandchildren Dylan and Ella ahead of a speech at Town Hall in New York City. 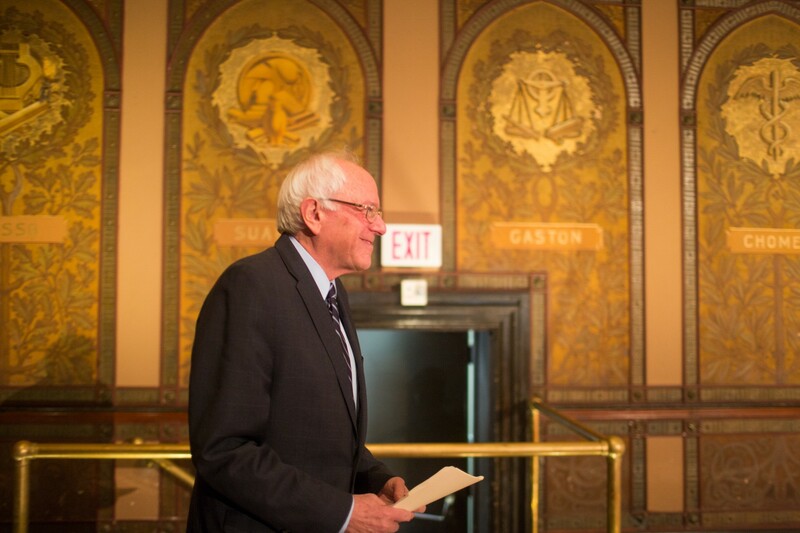 A portrait of Senator Bernie Sanders taken by his grandchild Ella Driscoll in the green room of Town Hall, NYC. 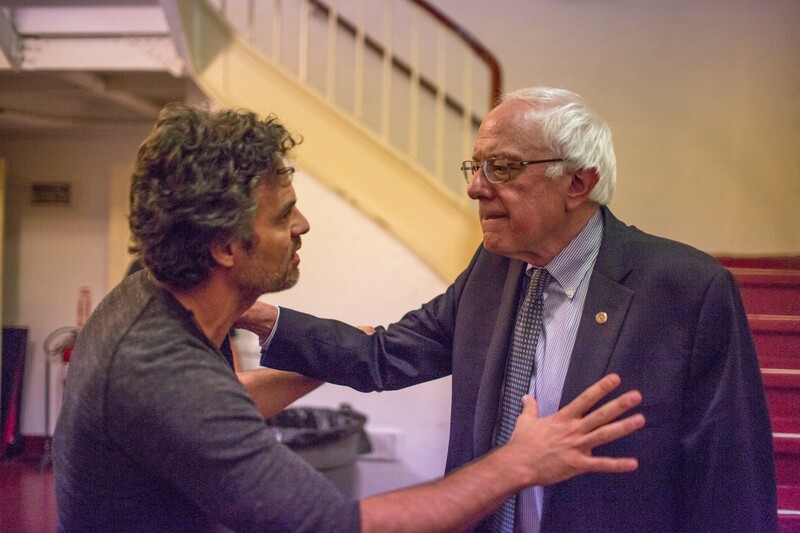 Actor and activist Mark Ruffalo excitedly explains his green energy jobs program to Senator Bernie Sanders backstage. 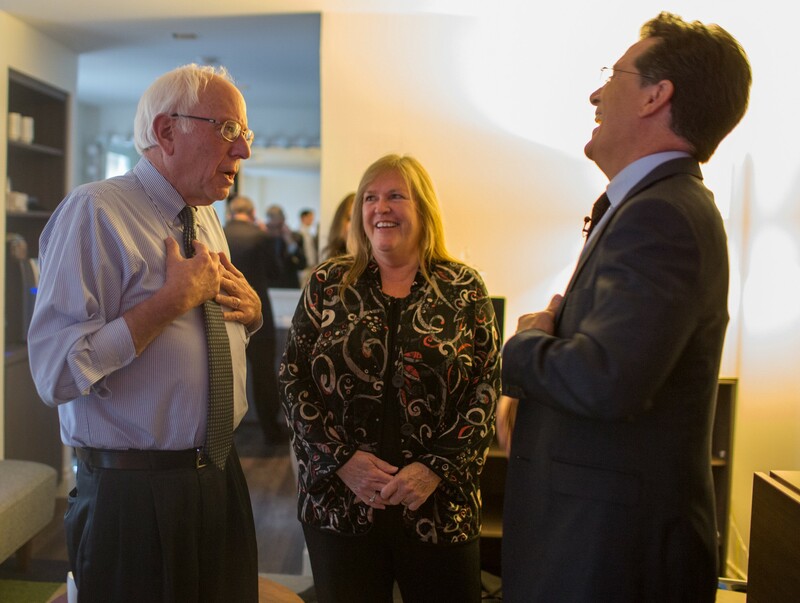 Senator Bernie Sanders cracks a joke to Late Show host Stephen Colbert and his wife Jane O’Meara Sanders in a green room in New York City. 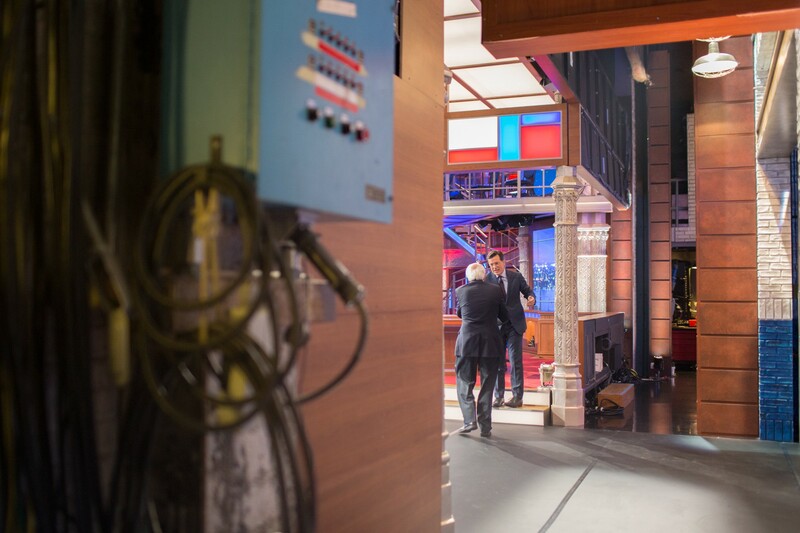 Senator Bernie Sanders walks onto the set of the Late Show with Stephen Colbert on September 18th. 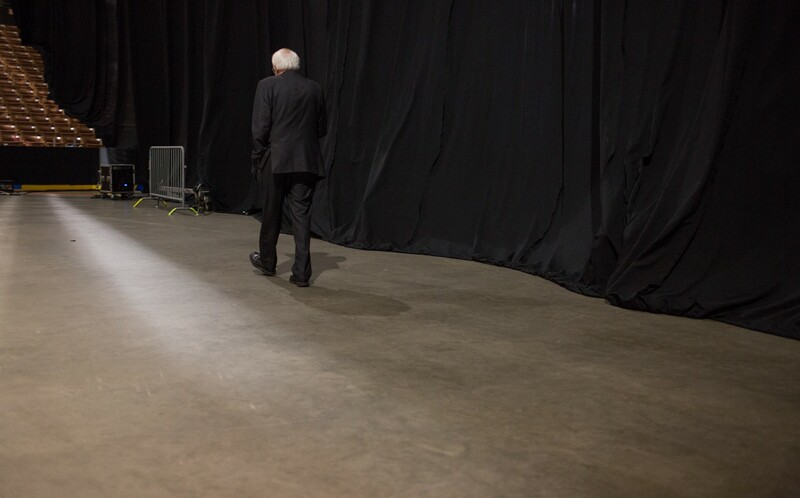 Senator Bernie Sanders walks backstage ahead of his remarks at the New Hampshire Democratic Party convention on September 19th, 2015. 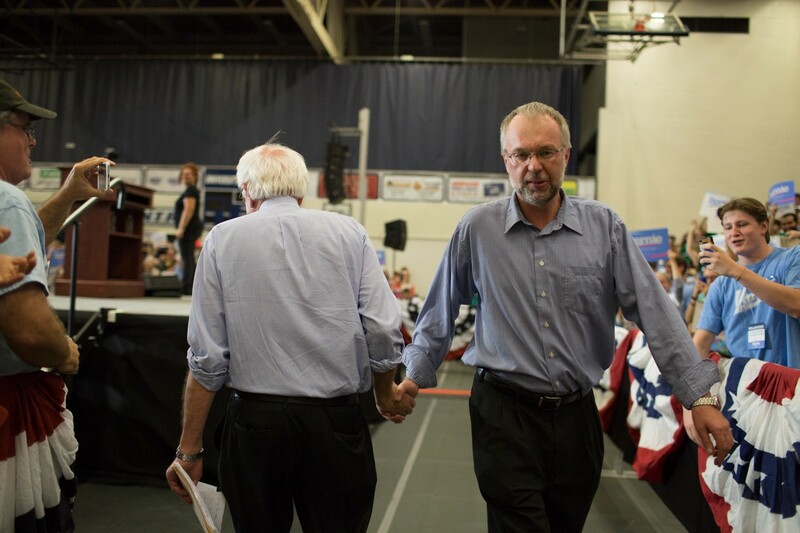 Senator Bernie Sanders gives his son Levi a handshake after his introduction at a rally at the University of New Hampshire in Durham, NH. 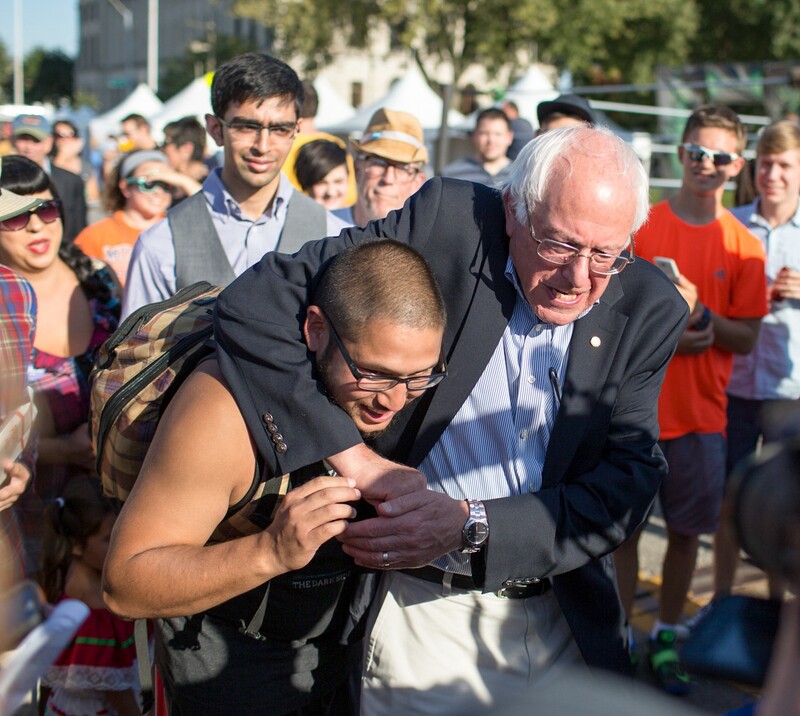 Senator Bernie Sanders, while attending at wrestling match at the Latino Heritage Festival in Des Moines, IA, puts a willing supporter in a head lock on September 26th, 2015. 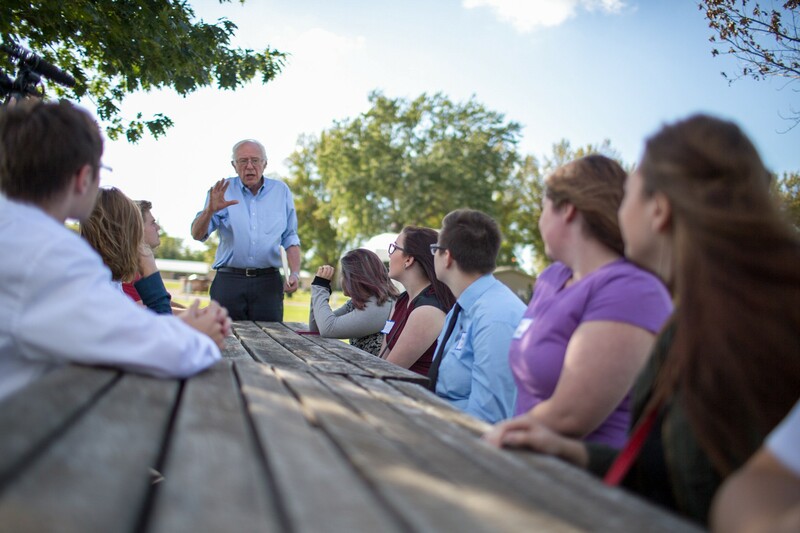 Senator Bernie Sanders speaks with high school students in Webster County, IA on September 27th, 2015. 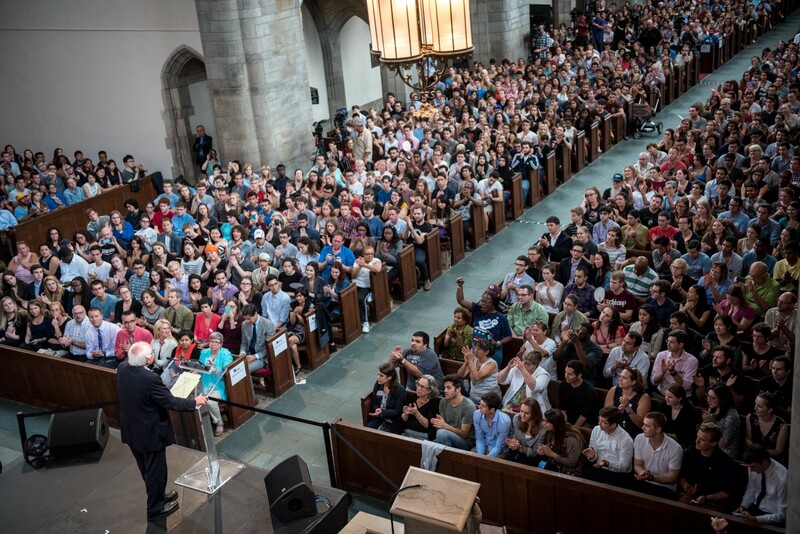 Senator Bernie Sanders addresses students, faculty and guests at the University of Chicago Institute of Politics in the Rockefeller Chapel. 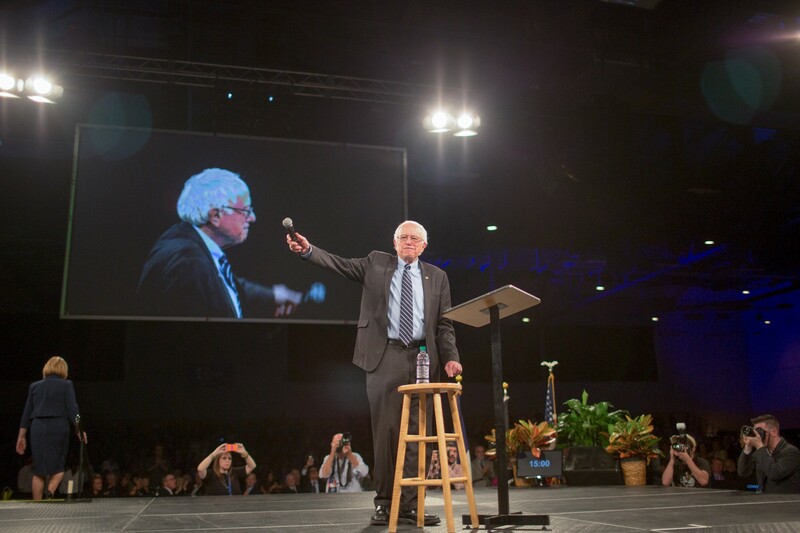 Senator Bernie Sanders speaks at a rally at the Boston Convention and Exhibition Center. 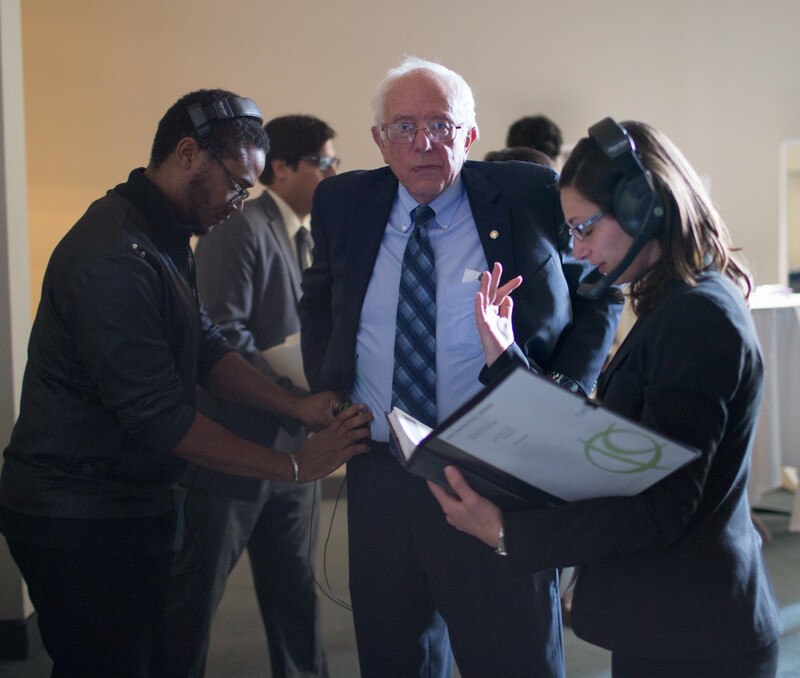 Senator Bernie Sanders gets mic’ed up before a speech to the Congressional Hispanic Caucus Institute in Washington DC. 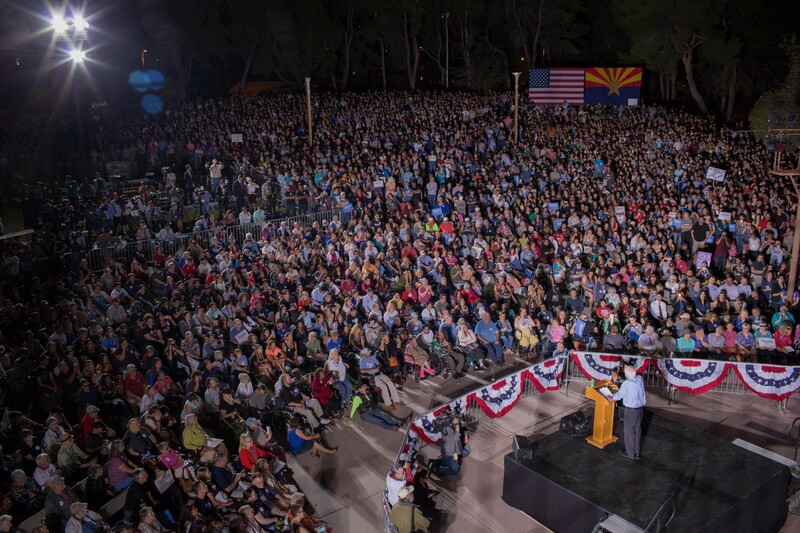 Senator Bernie Sanders speaks to a crowd of over 11,000 at the Reid Park DeMeester Outdoor Performance Center in Tucson Arizona. Potts Park in Boulder, CO provides a particularly beautiful backdrop ahead of a campaign rally for Senator Bernie Sanders on October 10th, 2015. 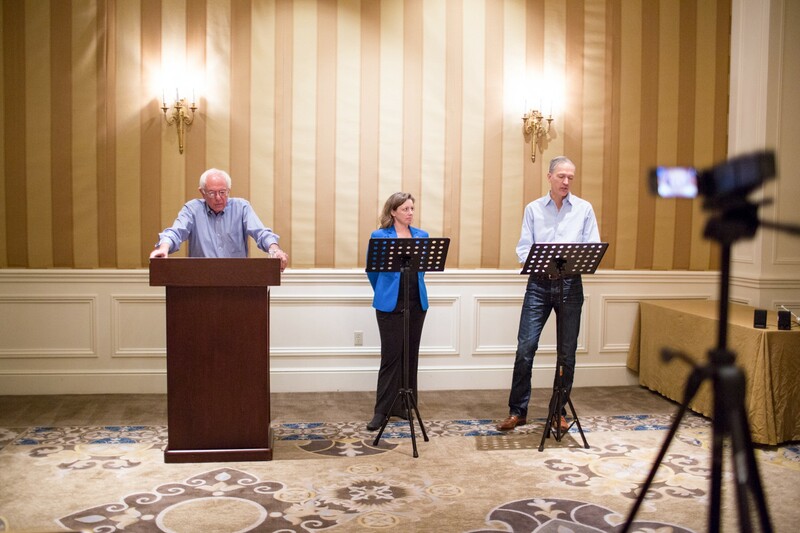 Senator Bernie Sanders prepares for the first Democratic Party debate of the season in Henderson , NV alongside Michaeleen Crowell and Mark Longabaugh. 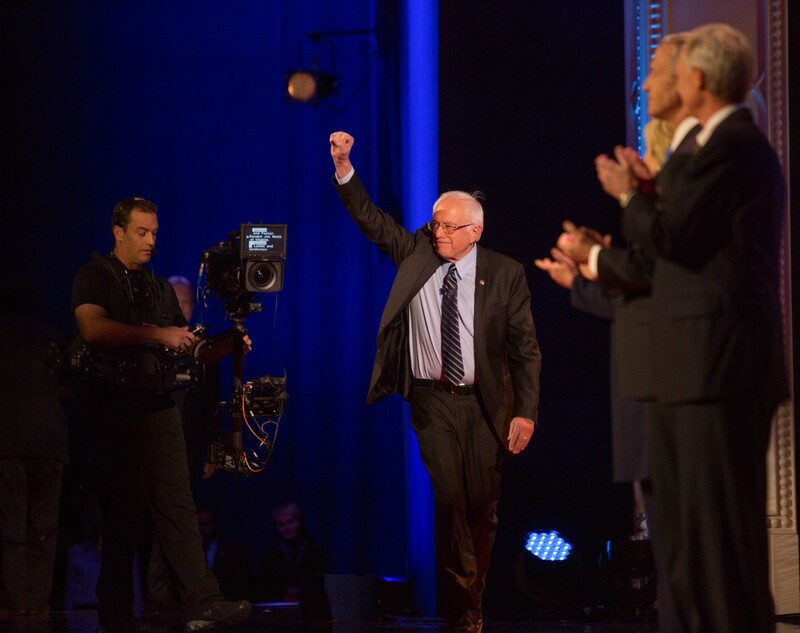 Senator Bernie Sanders takes the stage at the first Democratic Party debate at the Wynn Casino in Las Vegas, NV on October 13th. 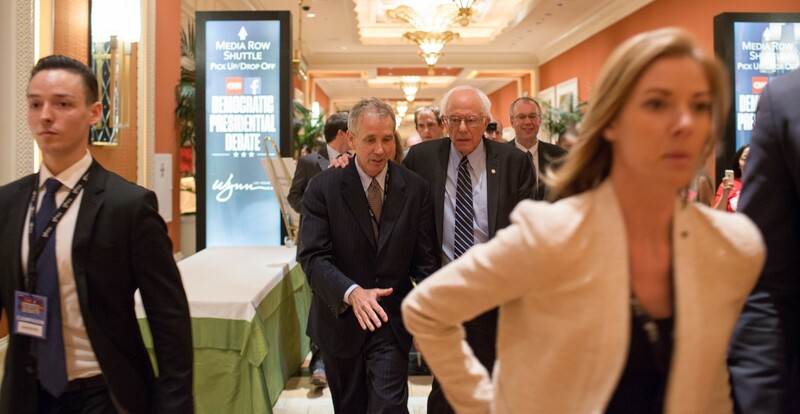 Senator Bernie Sanders walks to the “spin room” with communications director Michael Briggs after the first Democratic party debate. 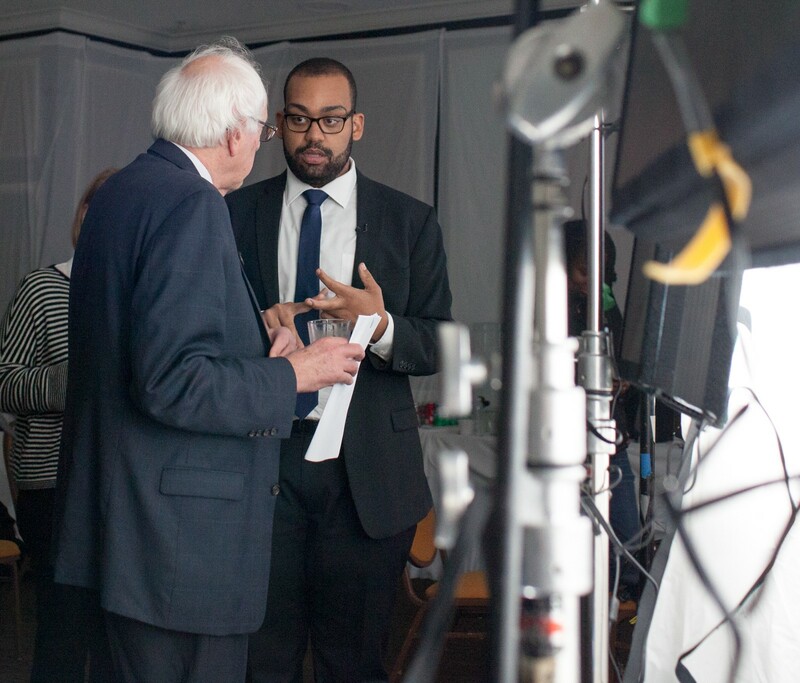 Senator Bernie Sanders shadow boxes with his wife, Jane O’Meara Sanders, and his son, Levi Sanders, in the green room ahead of his appearance on the Ellen DeGeneres show. 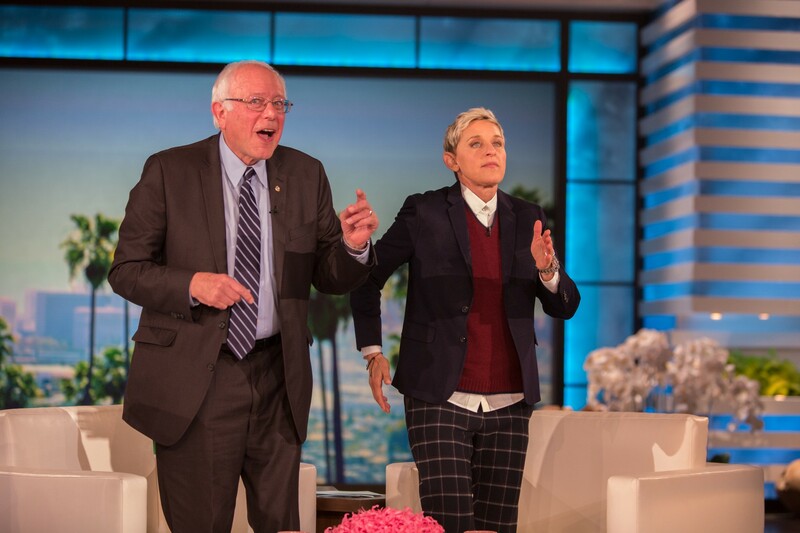 Senator Bernie Sanders dances with comedian and talk show host Ellen DeGeneres on her TV show “Ellen” on October 14th, in Los Angeles, CA. 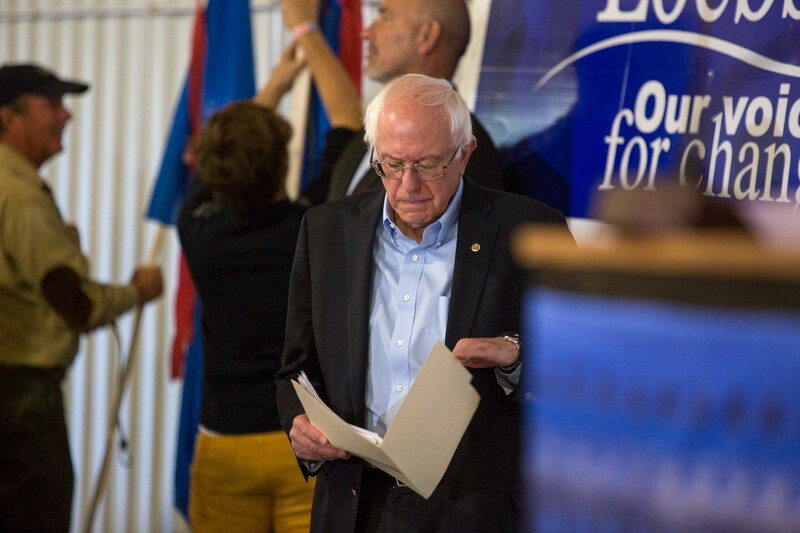 Senator Bernie Sanders checks his notes before hitting the stage at the Johnson County Democrats BBQ on October 18th, 2015. 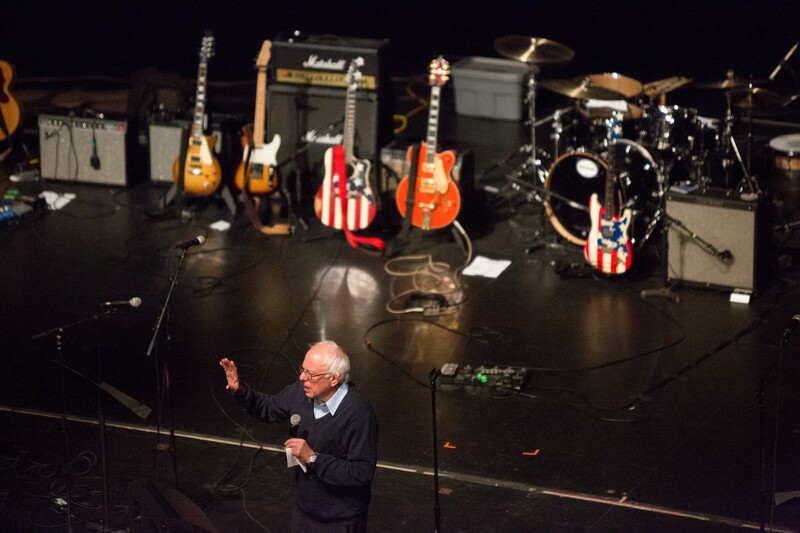 Senator Bernie Sanders addresses the crowd at the Alder Theater in Davenport IA after the “Rockin’ the Bern” concert on October 23rd. 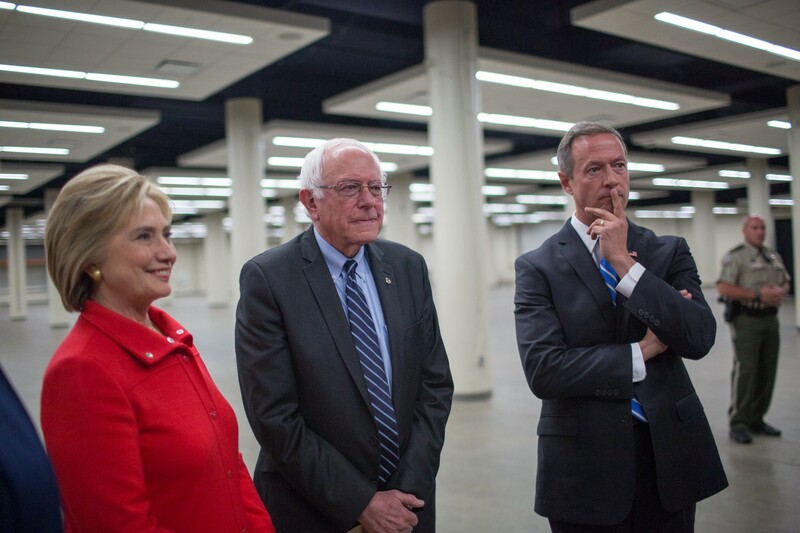 Senator Bernie Sanders stand with fellow Democratic presidential candidates Hillary Clinton and Martin O’Malley at the Hy-Vee center in Des Moines, IA. Senator Bernie Sanders delivers remarks at the Iowa Democratic Party’s Jefferson Jackson dinner at the Hy-Vee center in Des Moines, IA. 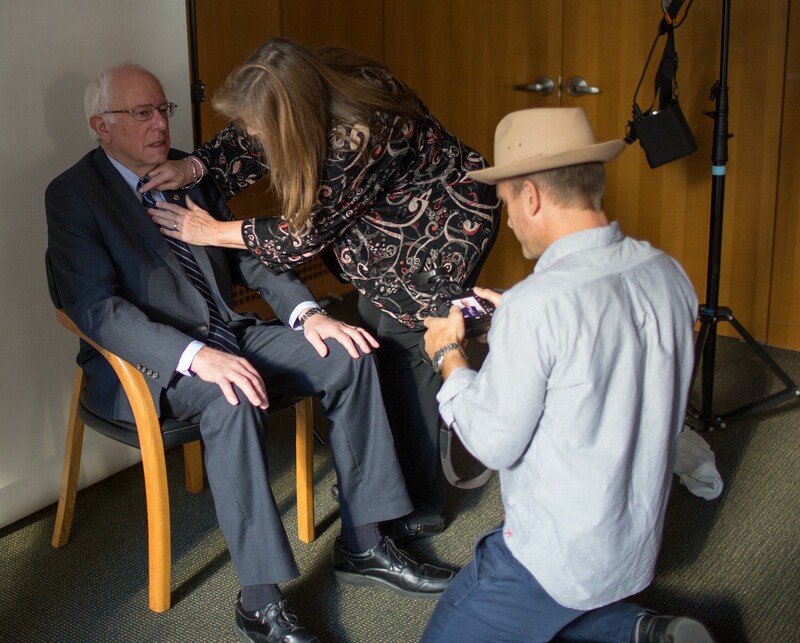 Senator Bernie Sanders has his tie checked by Jane O’Meara Sanders before getting his picture taken for the cover of Rolling Stone magazine in New York City. 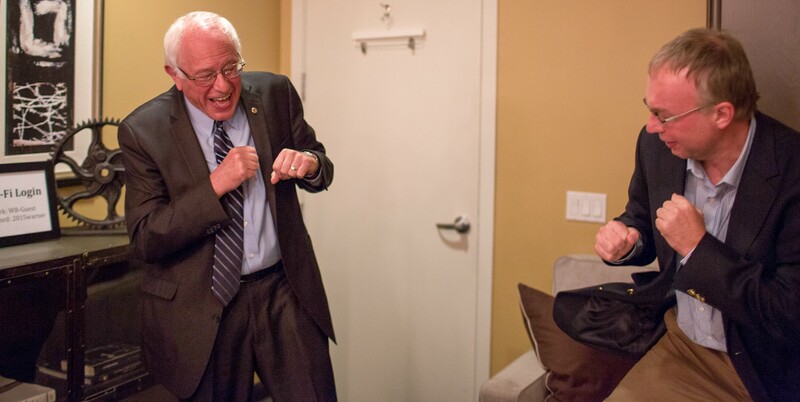 Senator Bernie Sanders stages a kiss with Joy Behar ahead of his appearance on “The View” on October 26th. 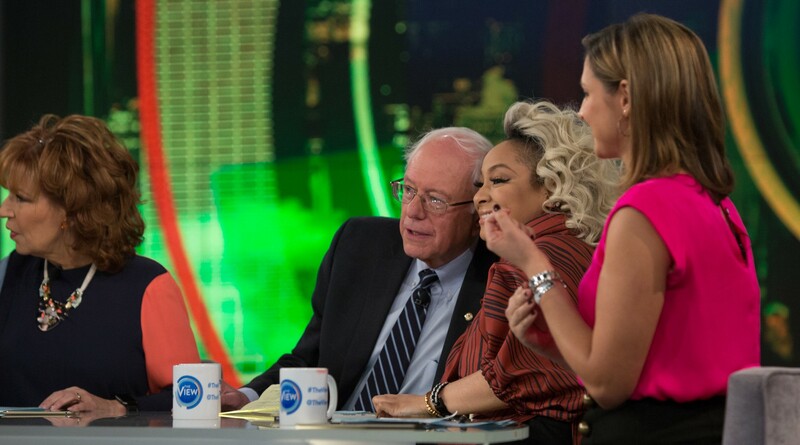 Senator Bernie Sanders and Raven-Symone pose for a picture during a commercial break of his appearance on “The View” on October 26th, 2015. 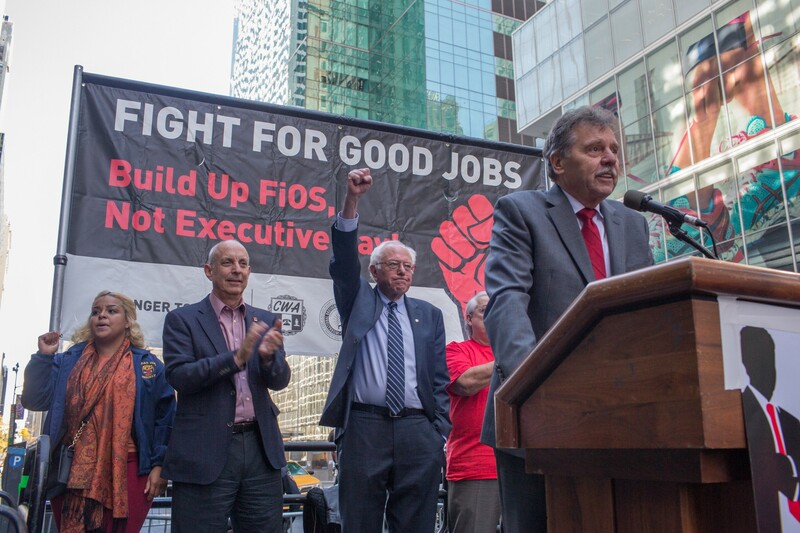 Senator Bernie Sanders showed solidarity with CWA Workers at an action in Midtown Manhattan on October 26th, 2015. 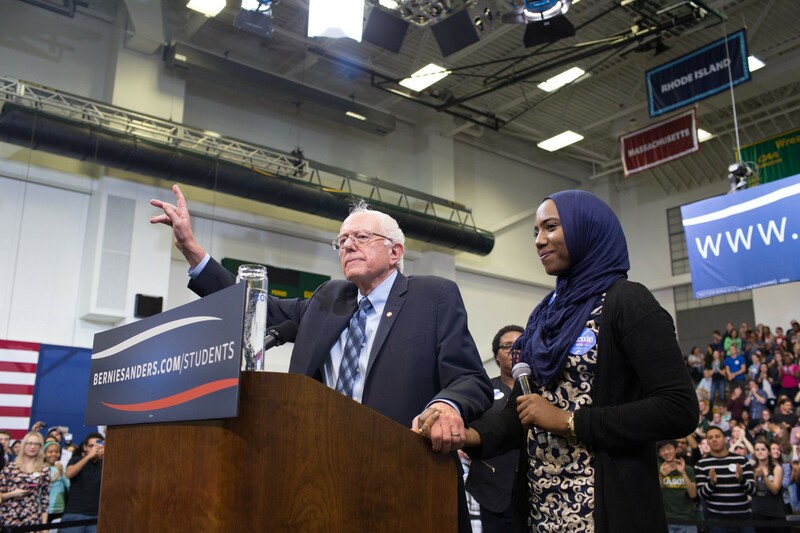 Senator Bernie Sanders answers a student’s question about Islamophobia at a Student Town Hall at George Mason University in Virginia. 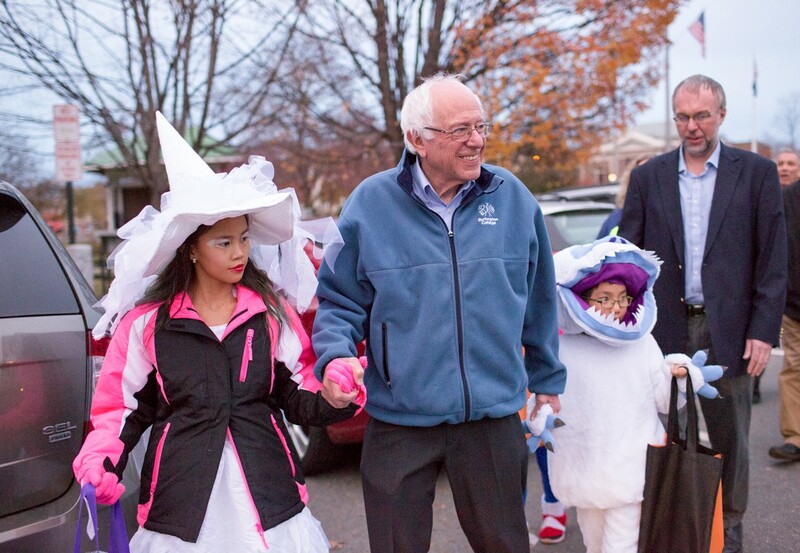 Senator Bernie Sanders and three of his grandchildren trick or treat in Lebanon, NH on October 31st. 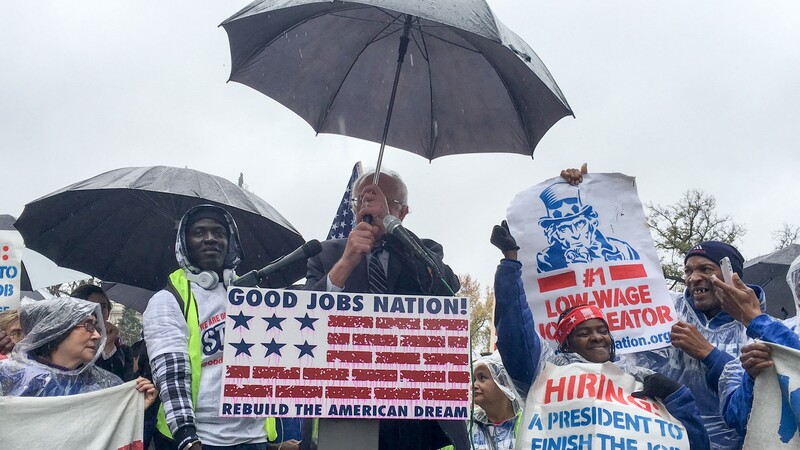 Senator Bernie Sanders adjusts his umbrella before speaking out in favor of raising the minimum wage in Washington, DC on November10th, 2015. 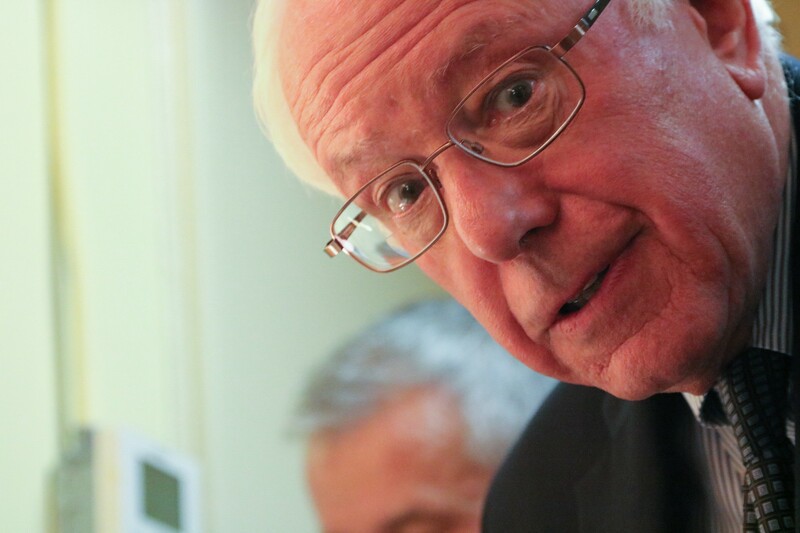 Senator Bernie Sanders speaks with host Ben O’Keefe before participating in the MoveOn Presidential Forum at the Capitol Skyline Hotel in Washington, DC. 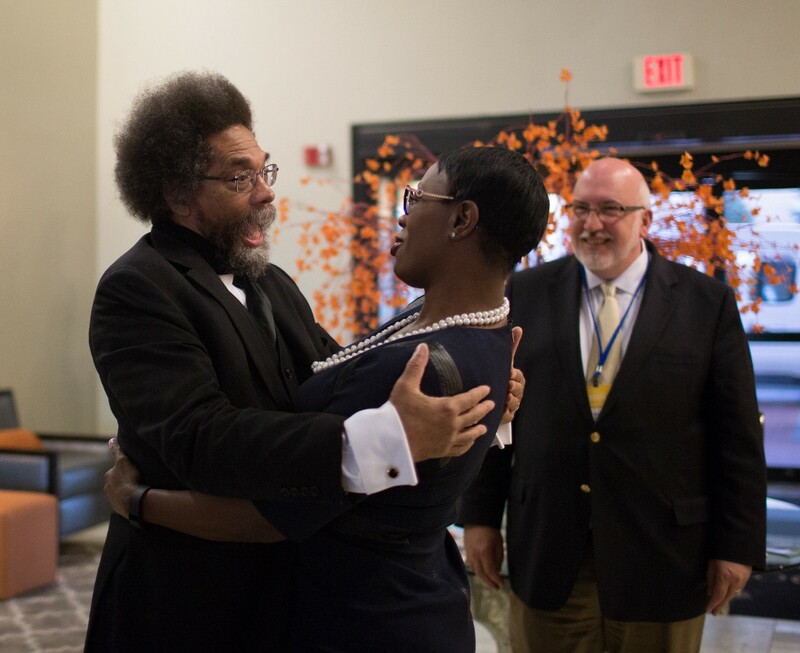 Two of Senator Bernie Sanders’ surrogates, Dr. Cornel West and Senator Nina Turner, embrace ahead of the Democratic Party debate at Drake University in Des Moines, IA. Senator Bernie Sanders is wished good luck by his grandkids Dylan and Ella, along with their parents Dave and Liza Driscoll ahead of the Democratic debate in Des Moines, IA. 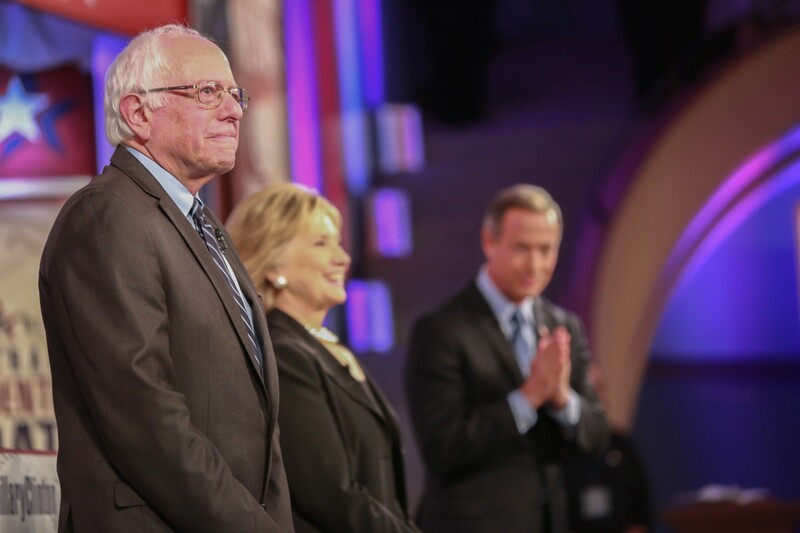 Senator Bernie Sanders takes the stage alongside fellow Democratic candidates Hillary Clinton and Martin O’Malley at Drake University in Des Moines, IA. 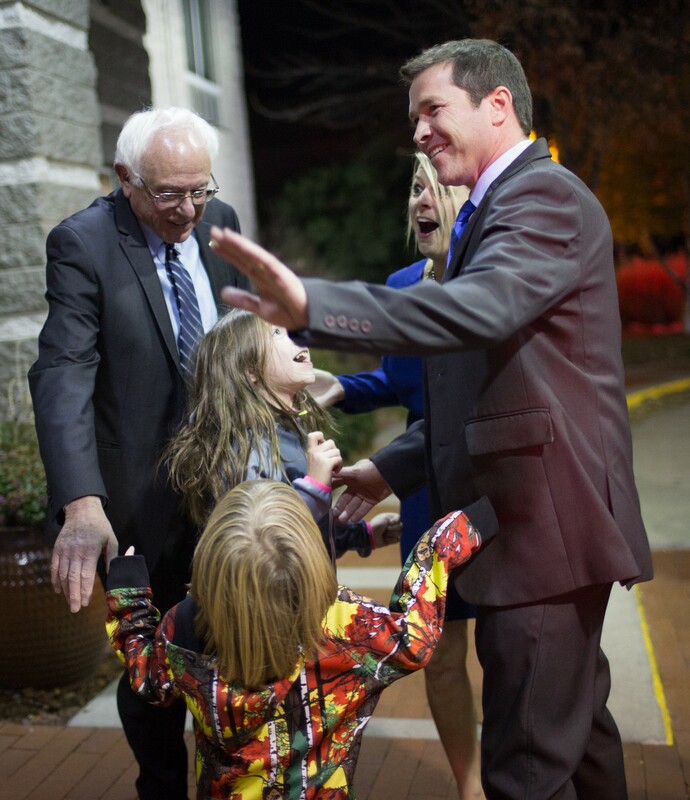 Senator Bernie Sanders is greeted by his wife, Jane O’Meara Sanders, and family after the Democratic debate at Drake University in Des Moines, IA. 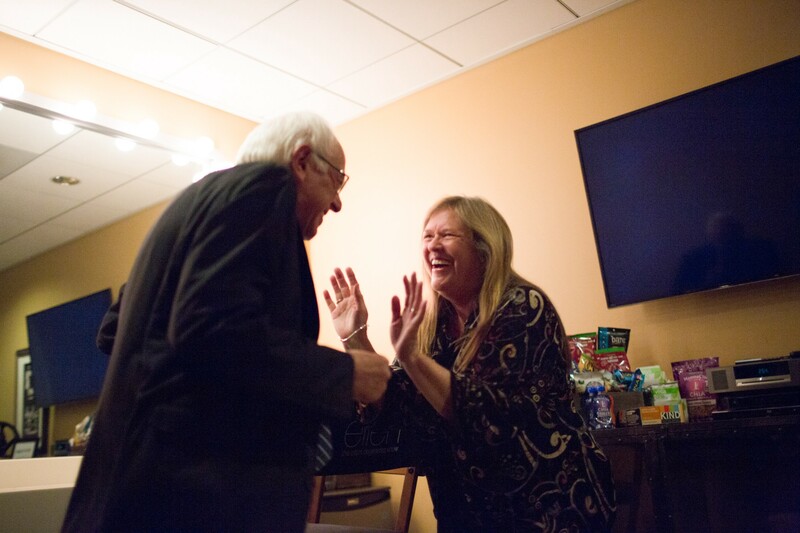 Senator Bernie Sanders and his wife, Jane O’Meara Sanders, get their photo taken for the Washington Post backstage at a town hall at Simpson College in Indianola, IA. 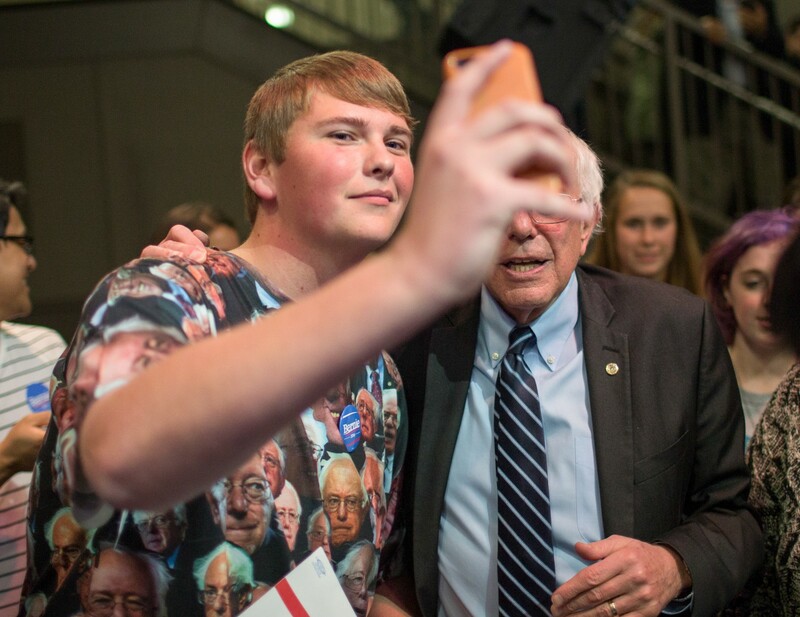 “That’s the weirdest thing I’ve ever seen in my life.” Senator Bernie Sanders encounters a t-shirt made of dozens of pictures of himself at a town hall in Indianola, IA. Surrogate for Senator Bernie Sanders, Senator Nina Turner takes the stage at the Cleveland State University’s Wolstein Center ahead of the Senator’s speech. 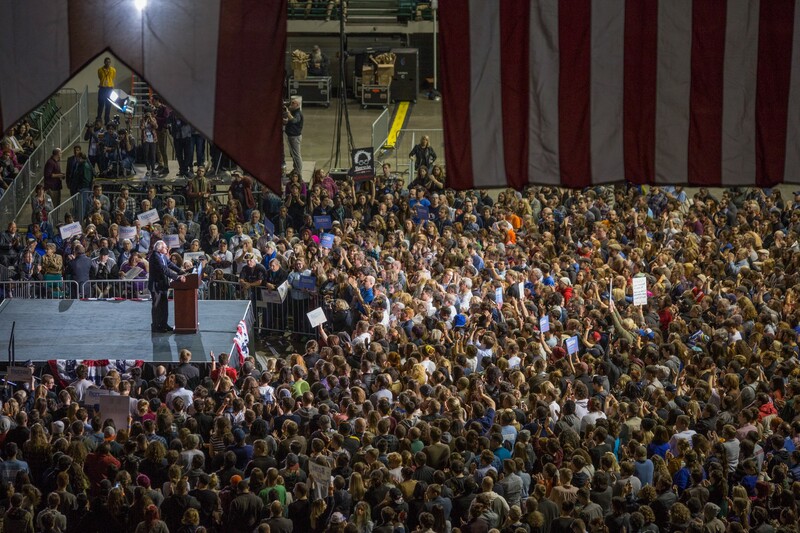 Senator Bernie Sanders speaks at a rally in Cleveland OH on November 16th at the CSU’s Wolstein Center. 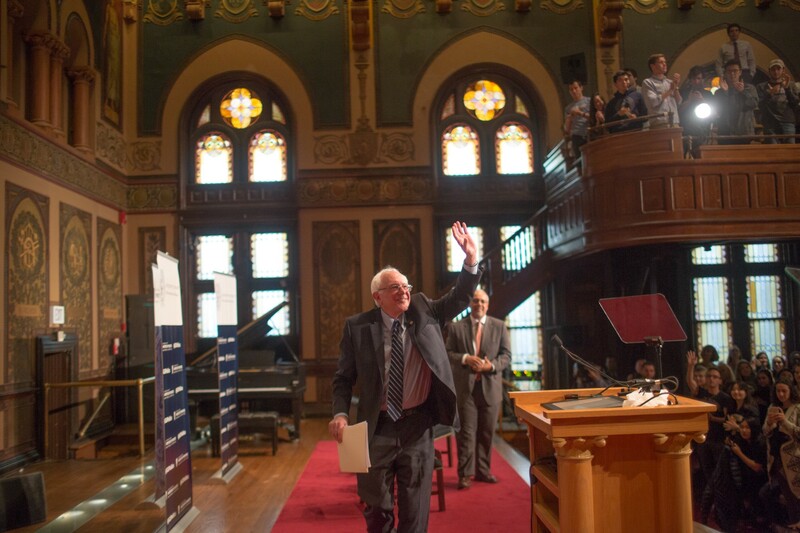 Senator Bernie Sanders speaks to students and guests about Democratic Socialism at Gaston Hall Georgetown University on November 19th, 2015. 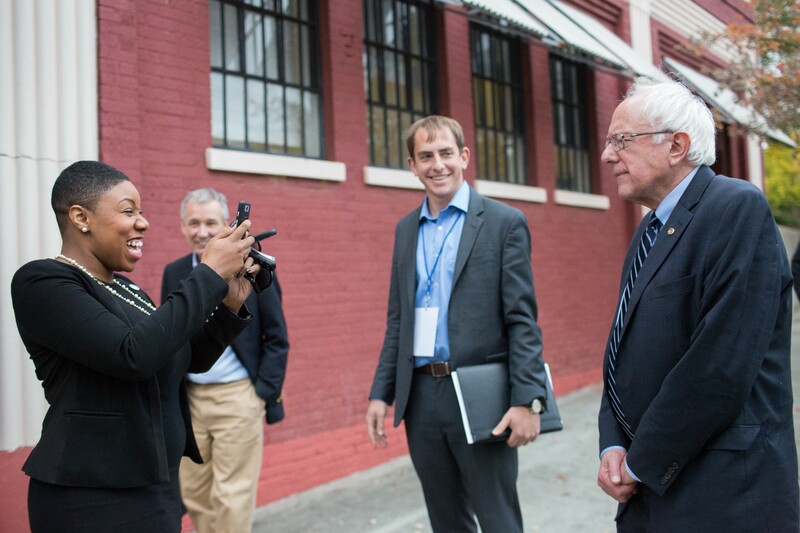 National press secretary Symone Sanders (no relation) films Senator Bernie Sanders for a SnapChat post on the trail in South Carolina. 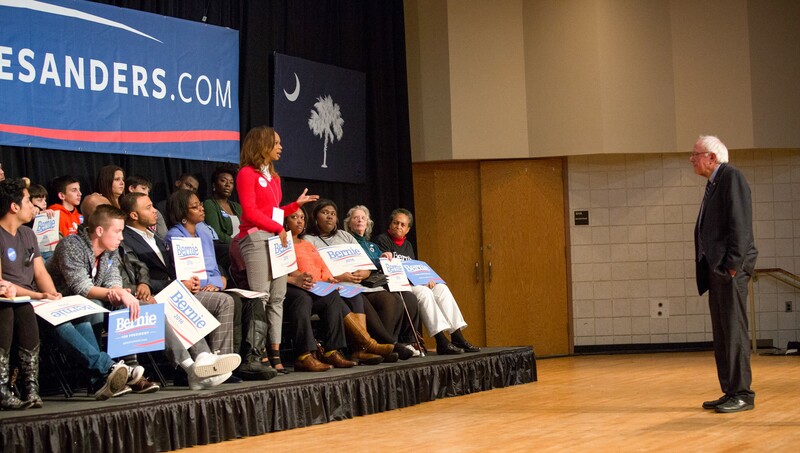 Senator Bernie Sanders takes a question from an audience member at a town hall in at the University of South Carolina in Orangeburg, SC. 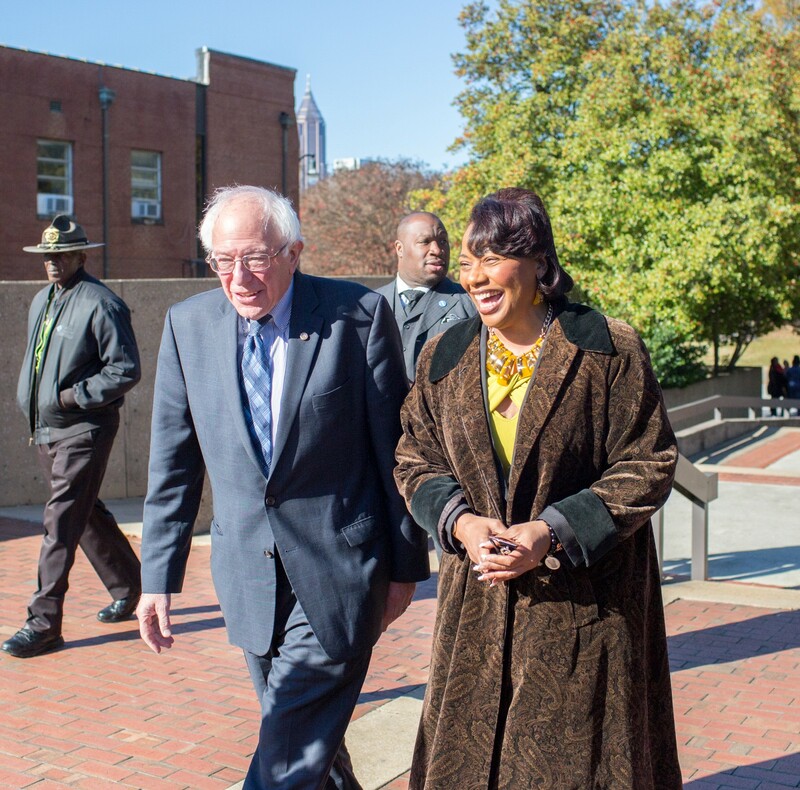 Senator Bernie Sanders gets a tour of the Martin Luther King Jr. Memorial from Dr. King’s daughter Bernice King in Atlanta, GA. 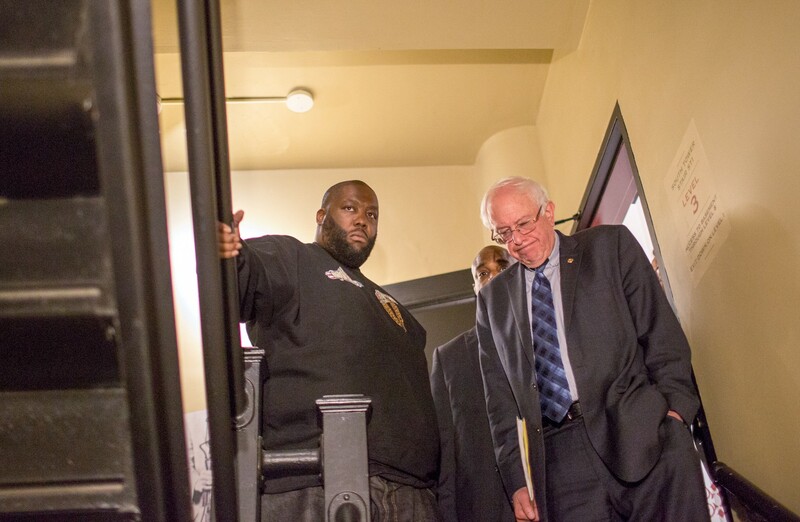 Senator Bernie Sanders and rapper/activist Killer Mike get ready for a rally at the Fox Theater in Atlanta, GA. 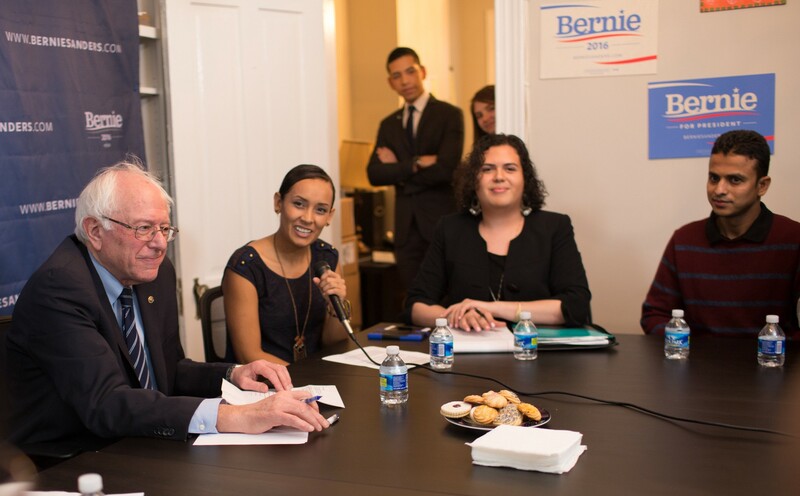 Senator Bernie Sanders is introduced at his online Families First meeting by Latino Outreach Strategist Erika Andiola at Bernie 2016 DC HQ on December 7th. 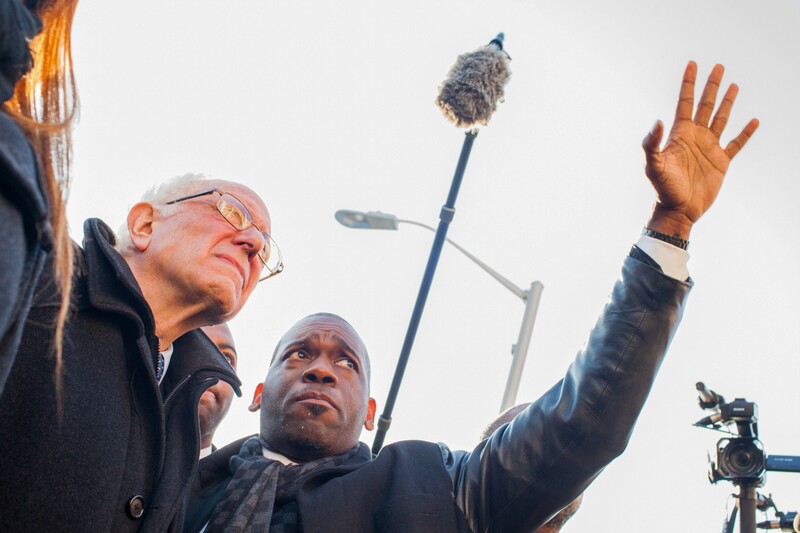 Senator Bernie Sanders walks the streets of the community outside the newly constructed Freddie Gray Empowerment Center following an event focused on poverty.